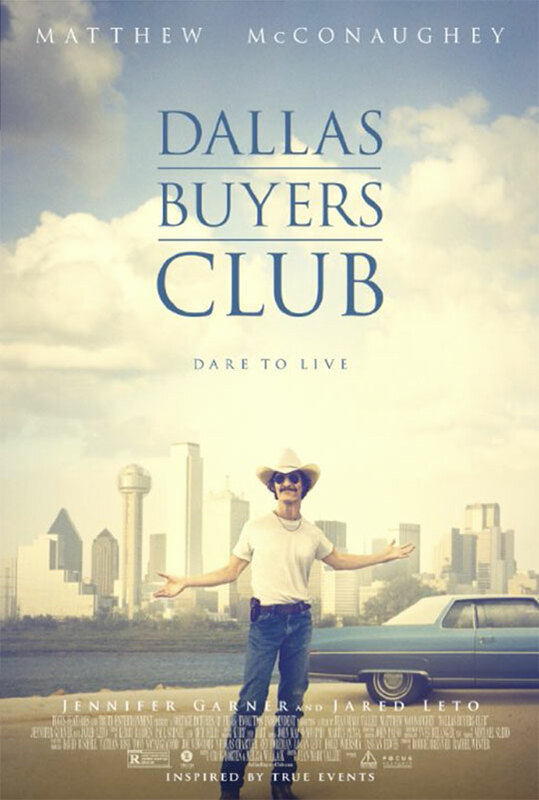 Dallas Buyers Club is about a homophobic Texan diagnosed with AIDS and given 30 days to live. Ostracized by his friends and with no effective treatment available in 1985, he begins importing illegal pharmaceutical drugs. It stars Matthew McConaughey, who looks frighteningly ill, as if he lost 100lbs for this role (like Christian Bale in The Fighter). Nominees for the 86th Academy Awards were announced two weeks ago and this movie got a lot of nominations, including Best Picture. Jared Leto got an Oscar nomination for playing a transexual called Rayon in this movie. There’s a lot to see in addition to transexual AIDS-patient Jared Leto, but there are two parts in particular which stood out to me. The first was seeing 1980’s Texan rednecks respond to a friend diagnosed with AIDS. The protagonist, named Ron Woodruff, is a deadbeat. The first scene depicts Ron swindling a group of cowboys, running for his life, and getting arrested. I have never been a Matthew McConaughey fan before, but he is amazing in this movie. I see why he got nominated best actor for this but Forrest Whittaker in The Butler did not. About halfway through this film the mood changes and Ron transforms into someone with a purpose, for the first time in his life (audience take note: acquiring AIDS gets Ron Woofruff out of the redneck spiritual gutter). The second part which stood out to me was condemnation of medical and pharmaceutical industries along with the FDA. In the movie, Ron discovers that non-FDA approved drugs treat his condition best. Faced with death, he chooses to break the law to extend his life, and eventually many others. He is a freedom fighter, defending the oppressed and marginalized. Does anyone still believe that the pharmaceutical and health industries have not been entirely dictated by profit for decades? I’ve had long conversations with my father about this in the past. By day he is a psychopharmacologist, but in his personal life he’s a Buddhist and alternative-therapy enthusiast. I find it fascinating that he spent decades refining his knowledge of pharmaceutical drugs, the human body, and how they interact with each other before being disillusioned by the dark and coldly profiteering side of the health industry. The medical marijuana movement in the United States a struggle similar to Ron Woodruff’s, which is prescient in the nation’s conscious. When everyone begins to discover that intolerance has led the federal government act against citizens’ interests (e.g., prohibition in the 1920’s), your mind brings to reel thinking about how much else they’re getting wrong. Despite Ron’s transformation into hero-like figure Dallas Buyers Club is gloomy and dramatic, and more about suffering and tragedy than redemption or accomplishment.